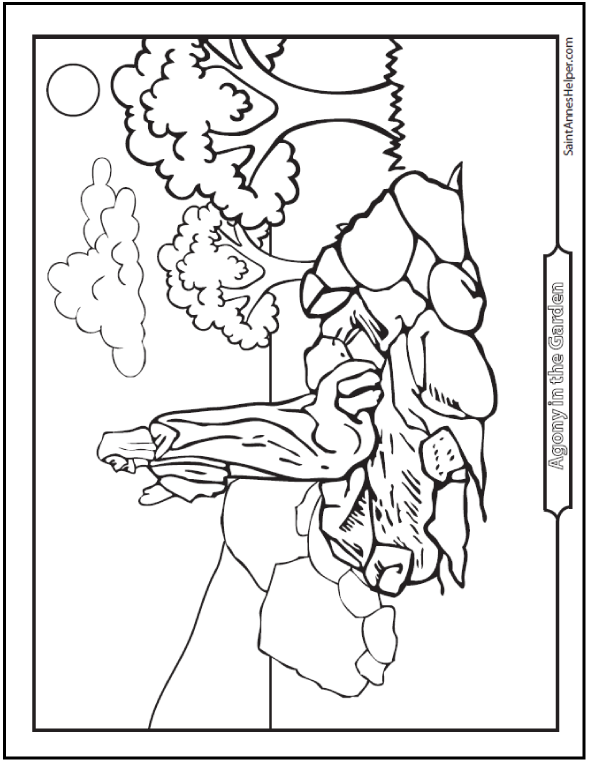 This Agony in the Garden coloring page shows Jesus praying in the Garden of Olives by Himself. He taught us to watch and pray. This is a wonderful image for teaching the First Sorrowful Mystery of the Rosary and the Bible story of Holy Thursday and Good Friday. Excellent Lent coloring page, too. This PDF prints 8.5x11" single sided. Beautiful Rosary coloring page. Jesus praying in the Agony in the Garden. The Agony in the Garden is the First Sorrowful Mystery of the Rosary. It's also a great meditation for Lent. On Holy Thursday after the Last Supper, Jesus went into the Garden of Olives to pray. It was late, so He was tired. He knew He needed to pray and wanted help. He Peter, James, and John to watch and pray, yet they would not wake from their slumber. Now He asks us to watch and pray in the First Friday devotion to His Sacred Heart. Can you watch one hour with Jesus? If you follow Holy Week with your children, they can learn to love Jesus dearly. Even though Jesus warned the Apostles, they were not prepared for the terrible night before Good Friday. If you can go to Holy Thursday Mass and the Holy Hour in the evening, they will marvel at the wonderful ceremony. Be sure to teach them that this was an important feast in the Jewish religion. If you cannot go to church, you can read a Children's Bible or show the pictures and tell the story to your children. Reading the Stations of the Cross with the little ones all snuggled on the couch can make a beautiful preparation for family Rosary time. First Communion Prayers: Audio, Coloring Pages, Worksheets for learning the Sorrowful Mysteries of the Rosary.